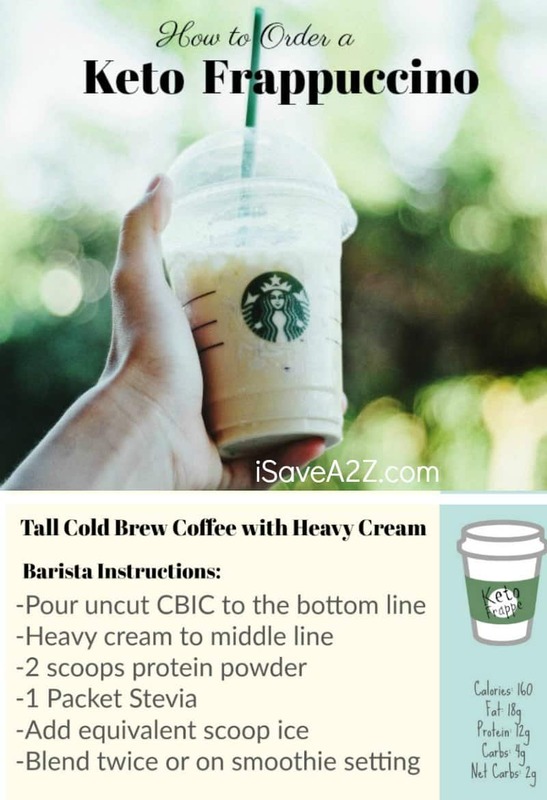 We all know how complicated the ingredients for the Ketogenic diet can be but take those rules to your local Starbucks and you might become a bit frustrated trying to figure it all out. “Hello, fellow keto-ers! I’m a Starbucks barista and new to keto, so I’ve had to get creative for my breaks and lunch at work. 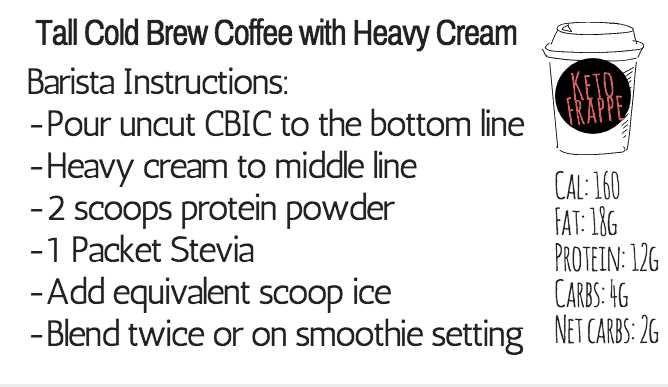 It’s essentially a cold brew, heavy cream, sweetener of choice and our protein powder, and ice blended together. 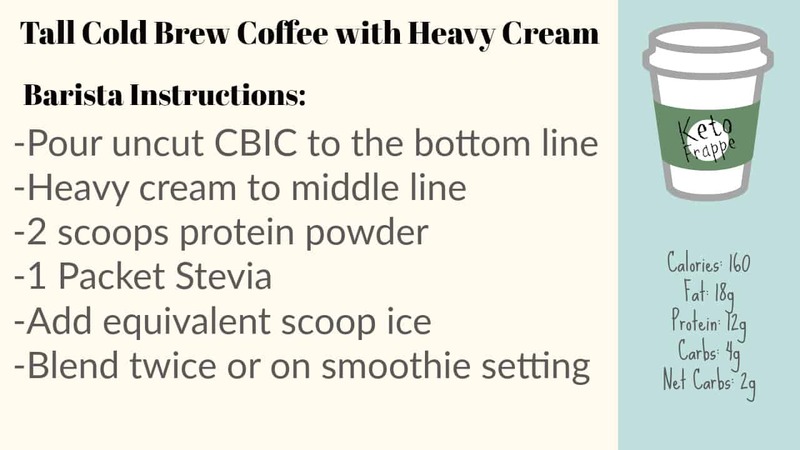 Keto “Frappuccino”: Ask your barista for a tall cold brew coffee with heavy cream. 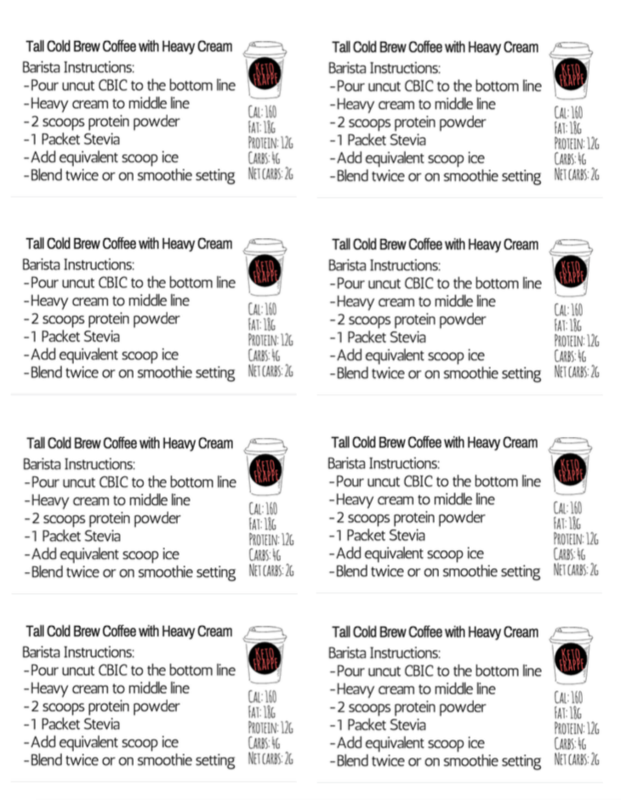 Undiluted cold brew to the bottom line, heavy cream to the middle, 1-2 packets sweetener(we carry stevia, Splenda, equal, sweet n low, as well as sugar-free vanilla or sugar-free cinnamon dolce>1-2 pumps based on your preference), 1-2 scoops of protein powder, tall scoop ice, double-blended. You know what my first thought was? I didn’t even know Starbucks has protein powder. Did you? My second thought was that I plan on making my own Starbucks Copycat recipe at home now that I know protein powder acts as an emulsifier! That’s good to know! WorldsOkayestBarista also goes into exactly how you should order this drink. Yes, people asked her to state it word for word on exactly what to say because they don’t want to overwhelm the barista, or even worse, get the order wrong. I didn’t read through all the comments but I did read that you cannot order this online because the system can’t handle the substitutions you are requesting. Also good to know. 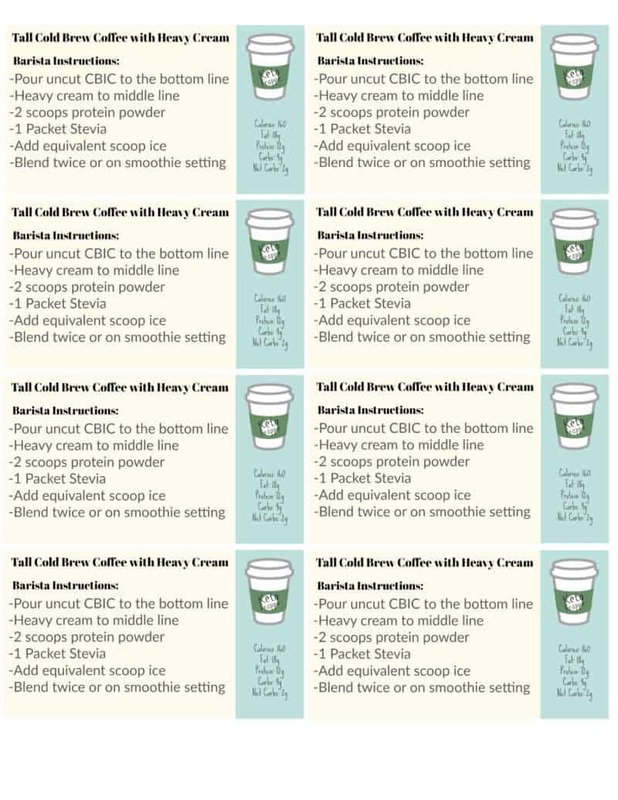 If you love going to Starbucks and this Keto Frappuccino is your recipe, I’ve created a printable version of this card that you can print off and keep in your wallet. Another barista mentioned that it’s easier for them to have simple instructions like this, especially during busy times! If you are likely to use these cards often, I would highly suggest laminating them. I purchased a laminator machine off of Amazon for fairly inexpensive and always buy these 8.5 x 11 laminator sheets there too because they are the cheapest I’ve ever found them. I’ve included both a color copy and a black and white version of each card. Or I have both of these cards in PDF formats with 8 cards to a sheet if you want to print many of them at a time. Don’t forget to Pin It on Pinterest for later! By Jennifer on January 2, 2018 Drinks, Keto Friendly Recipes, Ketogenic Diet, Recipes, Smoothie. I LOVE your site! I’m so excited to try your recipes. This site is what I’ve been looking for!